Dublin Decoded medieval gates, walls and towers walk (available private pre-booked groups). 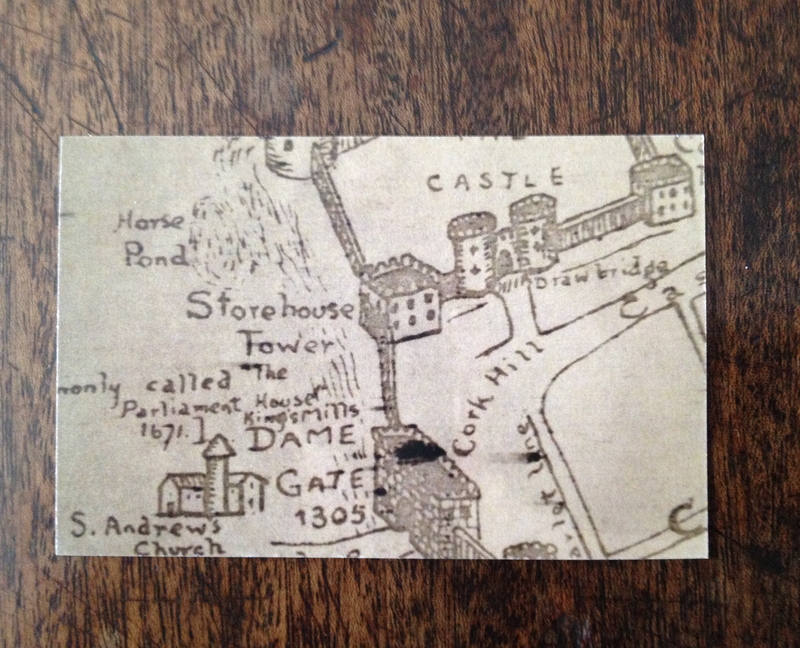 Tour details: In 1660, the year of the Stuart Restoration, Dublin was still a densely crowded network of ramshackle medieval mass, scooped out with only a network of tiny streets, courtyards and alleys. Over the next 150 years, it would transform into one of the finest neo-classical cities in Europe, as it did so, much of the old medieval city was knocked down and swept away, not least by the developments controlled by all-powerful Wide Streets Commission. So how can we look back today, to read, imagine and visualize what was here before? Join us, as we walk the route of the ancient city walls, gates, watchtowers, prisons and ancient churches of the old city, map in hand, discovering half forgotten stories, from daring escapes to devastating explosions, from war and famine to plague, invasion and revolution. Fee is €20 p/p. Concessions for artists, students and job-seekers €10. How to attend the tour: These tours often run as scheduled events, open to all. But if you don’t see a date advertised above, then to see when the next scheduled Medieval tour open to public goes ahead, (and when all all scheduled tours go each month) please just subscribe to monthly newsletter. The quick subscribe form is here. If you can already see when the next scheduled tour goes ahead, please use the booking calender on the “Tour calender and booking” page on Dublin Decoded, to simply book yourself in, on the relevant date. We will be in touch to confirm your place in due course. There is currently no deposit, as we work on a trust system, so please, don’t book unless you’re sure you can and will attend. Thank you. All Dublin Decoded tours are also available, on flexible dates, for pre-booked groups, via inquiry to dublindecoded@gmail.com You may wish to to consider making a custom group booking. The Medieval tour and all our tours can be booked for custom (private) pre-booked groups, usually either on Monday afternoon or at weekends, (Or Thursday evenings, in the case of the How to Read a Painting tour ) The private group booking option is one we recommend even for quite small groups, as it’s quite economical to book your own tour. Rates for pre-booked tours are a minimum of €100, for the first 2-5 people, but then €10 p/p after. With groups over 6/7 people and upwards, this can easily work out cheaper than joining a scheduled tour. Plus crucially, you choose your own tour on your own dates. For enquiry about for your own group tour, just send us an email to dublindecoded@gmail.com This is the general email for all enquiries to Dublin Decoded tours- so please specify the tour title, your preferred date or dates, and how many visitors, in your email or in subject header. Thank you. and remember, if you wish to join the monthly newsletter, the subscription form is here. For reviews of Dublin Decoded Tours on TripAdvisor, see here. Previous Post Paris Pictures part ii: snakes & elephants, a morning at the Flea market. Next Post cartography, Image & iconography from the City of Lights. Paris by map & era.